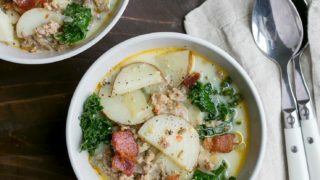 Zuppa Toscana (copycat Olive Garden recipe) made in just one pot to serve two. I feel like I’ve missed out on so much by avoiding meat for almost a decade. Today, even though I do eat a small amount of meat on occasion, I hardly ever combine more than one meat in a recipe. It feels weird enough eating one animal, but two? (Except for this Beef Bourguignon where the bacon coats the beef! Oh, and this Coq au Vin, too). Maybe I have a thing for bacon? But, my mother-in-law insisted that the copycat Olive Garden recipes for Zuppa Toscana soup on Pinterest were amazing. So, I tried a few. I can’t deny that I moaned upon first bite! What’s not to love? 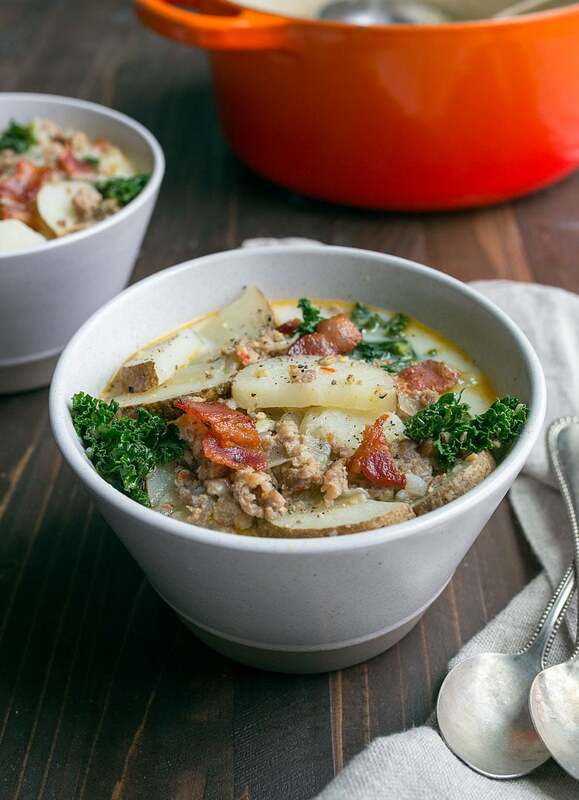 It’s a creamy potato soup bolstered by sausage. Don’t forget the kale, because if something has kale, it’s healthy and justifies the bacon, right? I didn’t think I was going to stir in the crisp bacon at the end, but I’m so glad I did! I’ve heard from some friends on instagram that the soup is still good without bacon. I’ve also heard that the Trader Joe’s tofu sausage works well here. Someone even told me that coconut cream is good instead of regular cream of half and half here. This soup gives you so many options! This soup should really be in your arsenal because it contains so few ingredients, and is so easy to pull together. I love that it makes just two big bowls of soup, because leftover soup for days is one of my pet peeves. Even though I do love leftover soup for breakfast (I know, I’m weird), there are times when I don’t want lots of leftovers. I made this in a small 2-quart Le Creuset Dutch Oven, but a regular saucepan would work, since it’s not a huge batch of soup. 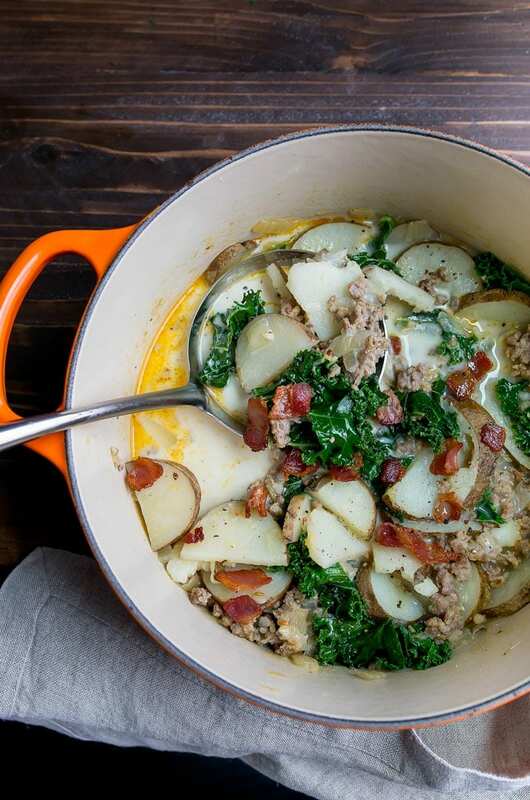 If I haven’t given you enough reasons, let me reiterate: potatoes, bacon, kale, and sausage. All in one bowl, got it? 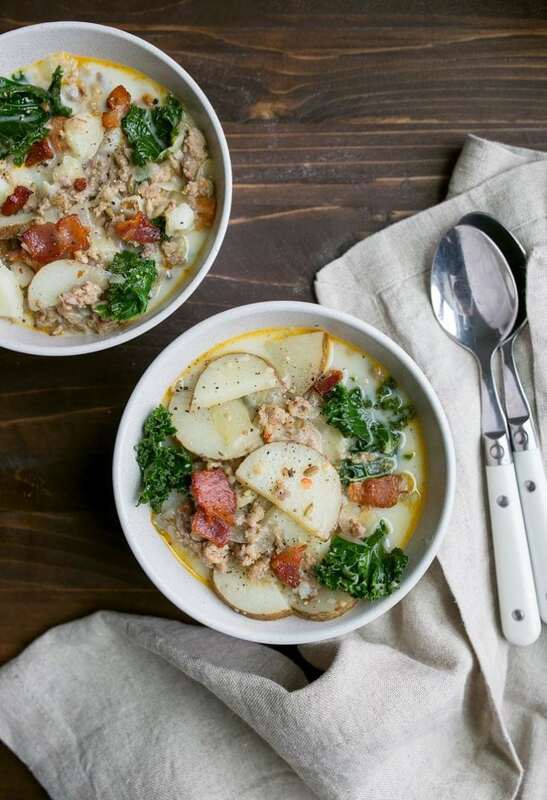 Zuppa Toscana for two made in one pot. My favorite Olive Garden copycat recipe! In a 2-quart Dutch oven or sauce pan, add the chopped bacon. Turn the heat to medium, and cook the bacon while occasionally stirring until it begins to crisp up around the edges. Remove the bacon from the pan, leaving the drippings behind. Next, add the sausage, diced onion and red pepper flakes to the pan, and cook while breaking up the sausage with a wooden spoon. Once the sausage is beginning to brown around the edges and is mostly done, add the chicken broth, salt and potato slices. Cover the pan and bring it to a gentle simmer to cook the potatoes, for about 8-10 minutes. Once the potatoes are tender, add the kale and cover the pan again for 3 minutes to cook the kale. Turn off the heat and stir in the heavy cream. Taste the soup, and add freshly ground black pepper to taste and additional salt. Ladle into two bowls, and top with the chopped bacon. Every time I try to go vegetarian, bacon pulls me right back in. Sigh. This soup looks wonderful and easy for a weeknight! I made this tonight; so yummy!! I added some cayenne pepper and exchanged spinach for the kale. Great results! PLEASE scale down more soup recipes! I love soup but most recipes feed a crowd and I rarely want the same soup two days in a row! This was so good, that even the non soup eating husband liked it. (Put bacon on anything he is all in!). Really enjoyed all the flavors and the ease of this recipe. Thank you for your time and effort into recreating this recipe. Fabulous. Oh my goodness! I made this last night for dinner, and it tasted amazing! I ended up using frozen kale because of recent back to back ice storms left the market I was at with slim pickins. Hubby raved over it also. Just the right amount to have one lunch size bowl of left over to take to work. I just made this for dinner. Super easy and delicious. Love this! Can’t wait until your next dinner cookbook ???? I am so happy to find your site! I love cooking for a crowd, but there are only 2 of us left at home. Oh, and your website is a delight. You have a typo for the calories, over 3000! For the whole pot :) I just divided it by 4 for 4 bowls of soup.